In 2005, when Chrysler unveiled the 300, everyone and their dog was impressed. Its aggressive lines, size and comfort all contributed to its success. A success it was. Fortunately, as the contemporary 300 had to make people forget a whole series of 300s (from 1955 to 1971), including some models considered classics. Six years later, even though the 300 was still looking fine, Chrysler had to come out with a new version more adapted to today’s trends. But it’s hard to change a winning formula. One bad design touch and sales could suffer irreparable consequences. It was a daunting task for Chrysler to say the least. When the first sketches of the new 300 appeared online, the disappointment was palpable. People (including me) felt a little let down. However, that was before we got to see it in person at the Detroit Auto Show in January. Though it isn’t radically different, the new 300 is radically different from the vehicle it is replacing. Let me explain... While the body is undeniably remenicent of its forebearer, it has been completely revamped. The chassis is the same (it’s practically perfect, so why change it? ), but each of the body panels has been modified. The windowed area has increased by 15% in response to one of the biggest client gripes about the previous generation. It seems that visibility was an issue. Consequently, the line looks somewhat like the old version, but the angles are softer, and overall it should age very well. But the most welcome changes are on the inside. The dashboard is all-new and no one is going to miss the old one. Chrysler engineers also worked on aspects that you don’t see. Though the false front fender doesn’t appear to be well finished, there are two 4x8 sheets of insulating material inside the 300. The suspension and steering were also redone, and better quality tires were added. The peeps at Chrysler didn’t mention it (or maybe I wasn’t listening when they did), but there is now a capless fuel filler door, like the one Ford offers. Under the hood, some things change, some stay the same. The 3.5-litre V6 has been replaced by the 3.6-litre Pentastar V6 that Chrysler uses all over the place. This engine produces 292 horsepower and 262 lbs-ft of torque. The other engine is very well known. It’s the 5.7-litre Hemi V8 with 363 horsepower and 394 lbs-ft of torque – a small increase over last year. Both engines are married to a five-speed automatic gearbox with manual mode. Do you find Chrysler a little stingy with just five speeds? Well, an eight-speed transmission produced by ZF is coming later this year! If only it had been ready at the same time as the rest of the car... The current transmission transfers torque to the back wheels when paired with the V6. With the V8 it can be either the rear wheels or all four. For the latter, the engineers revised the all-wheel drive and as a result the front wheels are totally deactivated when not needed, like when you’re driving on asphalt at cruising speed. How does it fare on the road? First thing worth mentioning, the interior is much brighter than before. The dashboard is functional and the 8.4 inch (21.3 cm) screen is big enough to be read easily. Overall the materials and assembly are all right, but what really caught our attention was the new, oh-so-comfortable seats that offer better support than in the past. Visibility is somewhat improved, but it’s still not perfect. No fewer than seven airbags are offered factory-standard. 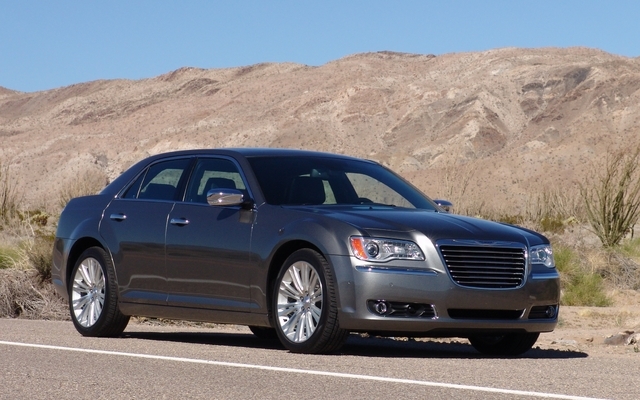 When we got our hands on the 300, it was a 300 Limited and a 300C with rear-wheel drive. As before, the V6 is the best option. It’s powerful enough and offers better fuel economy than the V8. Plus, it seems to make the vehicle a little easier to handle thanks to its lower weight. The five-speed gearbox seemed a little slow at times and, conversely, a little too eager on some occasions. Indeed, during lively accelerations from 80 to 120 km, for example, it would hesitate then fall into second, which nearly pushed the engine revs into the red zone before settling down at a more acceptable level. The performances were boosted at the expense of pleasure. During the test drive, our 300 averaged at 10.8 L/100 km, which is very decent when you consider the car’s serious weight (1797 kg) and our aggressive driving style. The suspension has barely enough clearance and roll when cornering is pronounced. However, not to the point of being dangerous. You might think it could contribute to car sickness, but who could be carsick in a 300! The steering appears to be more precise than before, but it still doesn’t deliver enough feedback. The next vehicle we got to drive was a 300C (when equipped with a V8, the 300 becomes a 300C). Climbing gas prices and environmental awareness could get you wondering why they would make a vehicle capable of such high performances. The 5.7-litre engine’s 363 horses and high torque level are evident from the get-go. Accelerations are reasonably lively and the engine sound is exquisite, though it is muffled by tons of soundproofing material. The transmission was a lot "calmer" on this unit. Compared to the V6, the steering was more precise, but the feedback wasn’t any better. The suspension was firmer, though not uncomfortably so, and contributes to terrific road handling. There’s no doubt that the 245/45ZR20 tires play a role in that, too. By the way, winter tires of this size must cost an arm, leg and everything in between! By the time we had completed our test drive, the onboard computer read 12.2 L/100 km, which is pretty decent. 8/10	Les fidèles ne seront pas dépaysés! 9/10	Avec le Hemi, pas de problème, ça avance!